Darstell. Beschr. Offiz. Gew. 4: 34d verso. (1863). Origin and Habitat: It is native to Morocco, where it occurs on the slopes of the Atlas Mountains in the surroundings of Marrakesh. 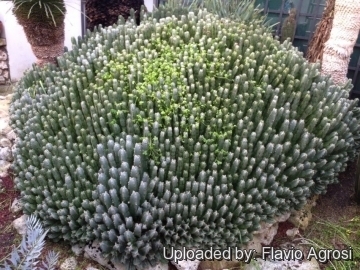 Euphorbia resinifera f. compacta hort. 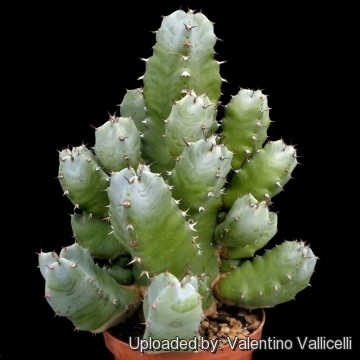 Euphorbia resinifera f. monstruosa hort. 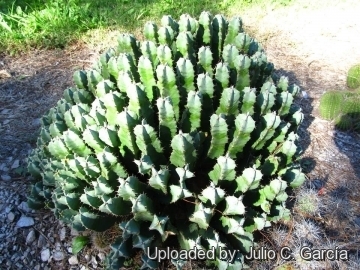 Description: Euphorbia resinifera is a dense succulent shrub growing to 60 cm tall, forming multi-stemmed cushion-shaped clumps up to 2 m wide. 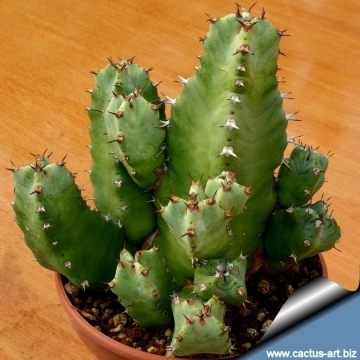 Stems: Erect, succulent, 4 sided (almost square) that look superficially like a cactus. Light green to glaucous blue color, depending upon light. Spines: Brown and short, but sharp in pairs of 6 mm spines on the angles of the ribs, spaced about 1 cm apart up the stem. 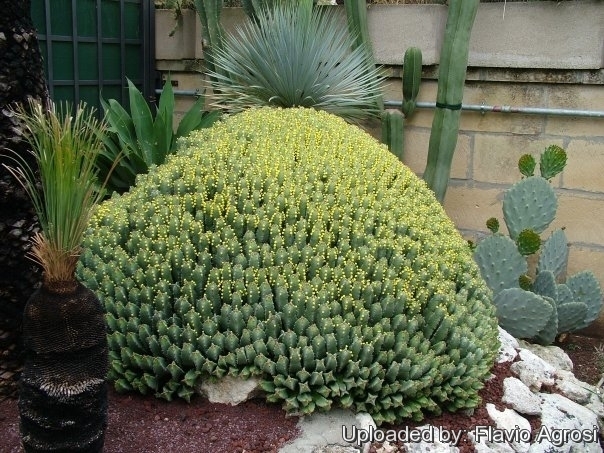 Euphorbia resinifera O.Berg in O.Berg & C.F.Schmidt: it is a small rapidly suckering plant that will form dense multi-stemmed cushion-shaped clumps up to 2 m wide. 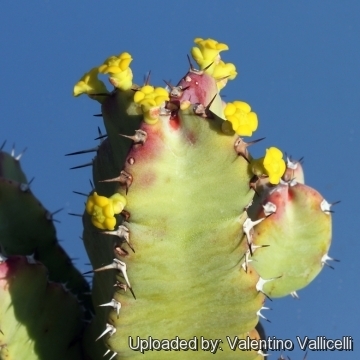 Euphorbia resinifera f. monstruosa hort. : this monstrous form produces lots of small, compact branches along the stem. 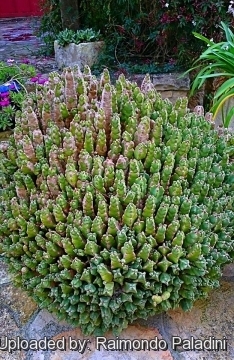 Notes: This is probably the oldest known succulent plant of all, having been discovered by an eastern king about 25BC, and may have been the plant which was originally named Euphorbia. 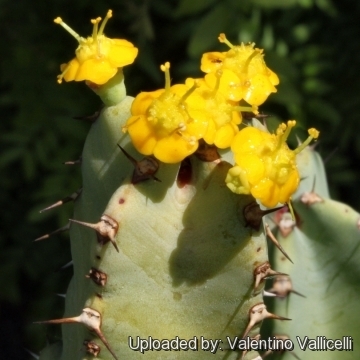 Warning: As with all other Euphorbias when a plant get damaged it exudes a thick white milky sap known as latex. This latex (resin) is poisonous contains some of the most potent irritants known. The very high irritant activity of the latex may be ascribed to resiniferatoxin (A potent toxin). The latex is particularly dangerous for the eyes, skin and mucous membranes. It can produce burning pain in bones. Pains in limbs and paralytic weakness in the joints. Important respiratory and skin symptoms, terrible burning pains. So pay extreme attention not to get any in your eyes or mouth. 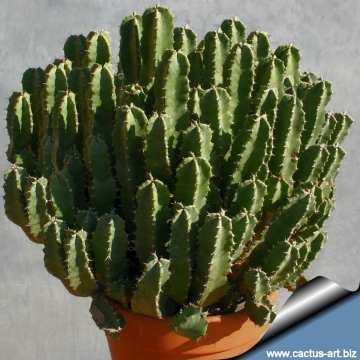 Cultivated plants must be handled carefully.